1. Place some ground coffee in a coffee filter or filter paper in a funnel. 2. Positon on the top of a clear glass. 1. Now try filtering your berries by using a colander. 2. Run tap water over your berries to filter the dirt from your fruit. 1. Now try filtering dust from your breath by raking over dry dirt while wearing a dusk mask. Filtering is the process of separating a liquid and a solid. Filtered Coffee machines filter the ground coffee by letting the black coffee solution through. 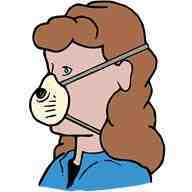 Doctors wear operating masks to prevent the germs from their mouths to get inside the patient while allowing air to pass through. A dust mask filters tiny bits of paint to stop them from getting into the lungs yet air can get through. A colander is used as a filtering device allowing the water to run off the berries you are rinsing.